You are currently browsing the tag archive for the ‘ravenswood’ tag. For the second year, we will convert our studio to a public art gallery for the Ravenswood ArtWalk on Saturday, October 2nd and Sunday, October 3rd, 11a-5p. 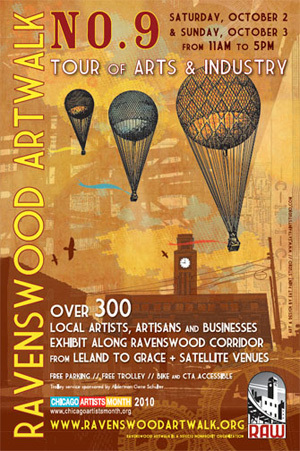 Over 300 Artists and Businesses are participating in the 9th Annual Tour of Arts & Industry in the Ravenswood Corridor. This self -guided tour of open studios, galleries and spaces along the historic Ravenswood Corridor is the annual kick off to the 15th Annual Chicago Artists Month. This year we will be hosting three fantastic artists that echo our sustainable ethos. moss studio will transform to moss gallery this weekend, October 03-04 for Ravenswood ArtWalk. moss will host three terrific Chicago artists among the 175 artists participating in RAW2009. Please join us, 11a – 6p Saturday and Sunday | West Byron Street & Ravenswood.